Published: Sept. 7, 2014 at 01:34 p.m.
Philadelphia Ealges quarterback Nick Foles is sacked and fumbles. Jacksonville Jaguars defensive end Andre Branch recovers. 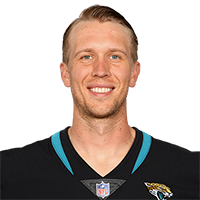 Published: Sept. 7, 2014 at 01:18 p.m.
Philadelphia Eagles quarterback Nick Foles is sacked by Jacksonville Jaguars defensive end Chris Clemons causing Foles to fumble.